I needed a kick start to my solo travel across the UK or maybe I needed a kick to start! I decided to do it myself.. After wasting plenty of weekends and bank holidays, as they call government holidays here, I was determined to do something on the second bank holiday of May. But yet again, the Saturday n Sunday went past doing nothing. 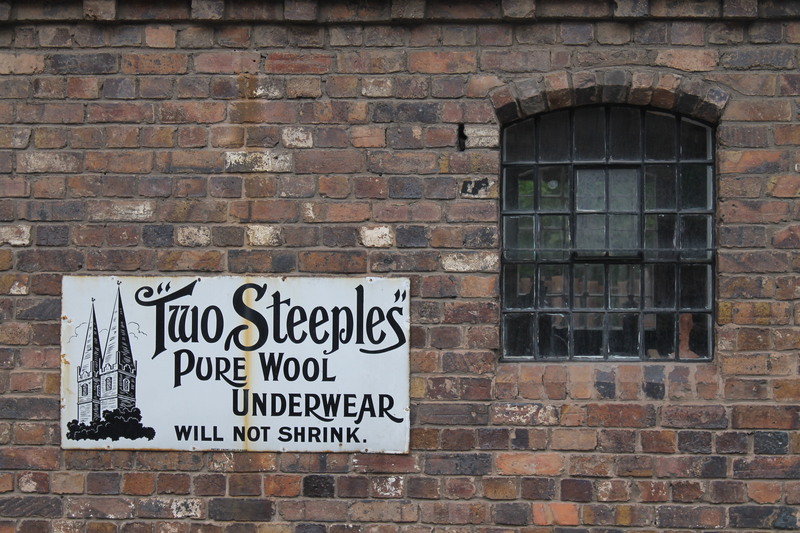 I had no option but to kick now and I would have done it if not for getting up on the holiday Monday and planning a drive to the Blists Hill and the Iron bridge! Blists Hill is a small town, known for its mines, located amidst the forests of Shropshire in the West Midlands. The village was once a thriving industrial region of blast furnaces and mines. The Shropshire canal that runs along the lower regions of this area made it easier for transportation of clay and iron into the fast developing world that was in dawn of industrial revolution. As years passed by, this site was abandoned before it was decided in 1973 to protect this area of historical importance with industrial revolution. Soon, this area, called as the Iron Bride Gorge, including the Blists Hill was declared a UNESCO World Heritage Site. 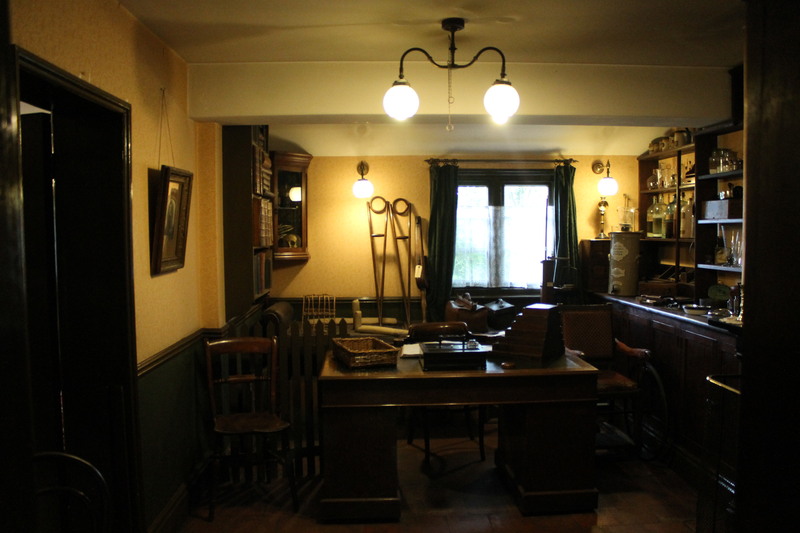 But what made Blists Hill more famous was its recreation as a Victorian Town of 18-19th century! The Midlands and the region around has a great part to play in the British history. This area was once the most thriving and important revenue generator for the UK. The industrial revolution that broke out in these valleys gave Britain a prominent place in the World map and a strong financial back up. But soon the world wars came and it is told that when the German army planned to bomb the historic city of Coventry, in the heart of the midlands, British government decided to sacrifice it for good. It was a strategic move citing the reason that they would give upon their financial hub and go onto win the war rather than defend it, revealing about the informer within the German army and thus losing the upper hand. As you purchase the GBP 15 ticket and pass through the alleys of the ticketing counter into an open land, you are shown videos of how iron was cast and the lives during those days which sets you into the mood. This couple of minutes are certainly like a time travel because when you step out at the other end, you are transformed 2 centuries back into a Victorian town. The village entrance has a common notice board that has announcements from the council, police and also of the important events that are taking place in the village. The notice board has some funny, quirky notices, few of which might look bizarre. I was disappointed to read one of the notices that said ‘Kaleidoscopic theatre is not here today due to illness’. It would have been interesting to see people gathered around a push cart theatre. 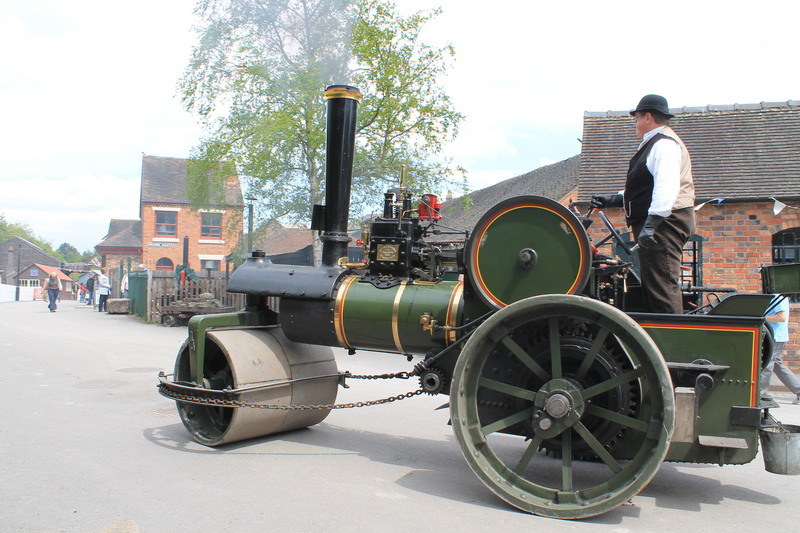 The streets of Blists Hill is recreated the way it was then. The roads are muddy and a white dust is spread on the roads instead of asphalt. Stone buildings with tiled roof adorn both sides as we walk along the street. There is horse carriage waiting for its customers who would want to go into the village. A shire horse with its rider and the coach was a good sight. 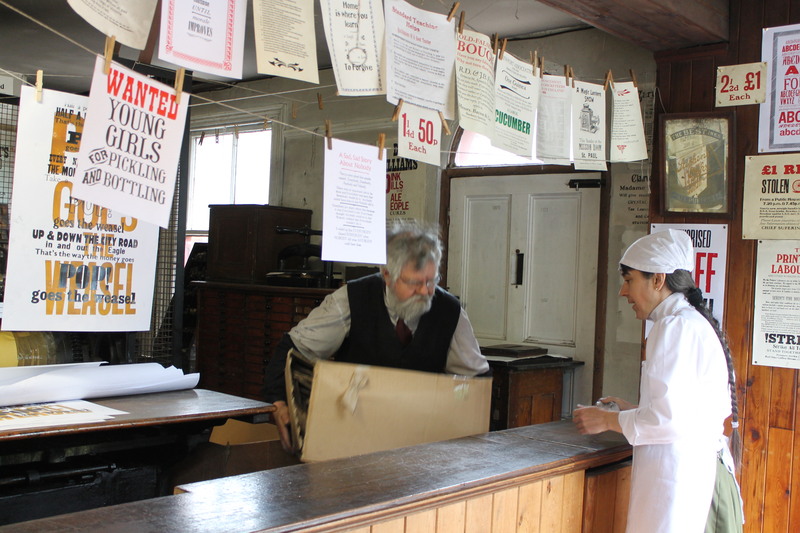 The most interesting thing about Blists Hill is that you can still use the shillings and pennys as money like it was during the old days, in fact you can spend them in the shops, eateries and other places around this village. You don’t have to carry shillings with you, there is a branch of Lloyds bank in a honey coloured stone building right at the entrance, very typically arranged like an old bank, that exchanges pounds for 5 different coins like shillings, farthings, pennys etc. You can spend as many as you want and then at the end if you are left with any then exchange it back at the bank or keep them as souvenirs! Interesting isn’t it!? The people in the village are all taking care of one or the other shops and all dressed in the Victorian clothes. You get to see women’s gowns developed wide puffed sleeves, small hats etc and men in three-piece suits along with patterned fabrics for shirts accompanied by various forms of facial hair including moustaches, side-burns, and full beards. There is a draper, confectioner, candle maker, chemist, doctor, printer and photographer. You can even dress up in those clothes at the photographer and get a picture clicked. 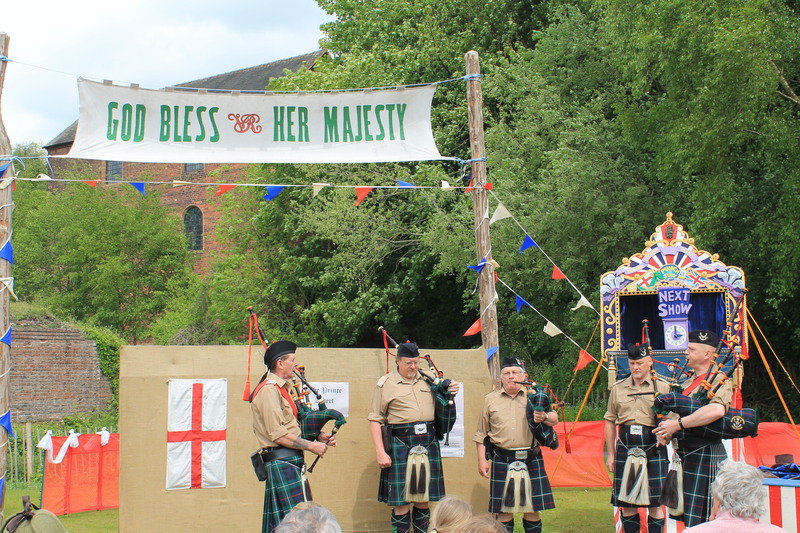 On the day I visited, the village was celebrating queen Victoria’s birthday and had some sort of fair set in the village greens. I was lucky to see a highlander pipe band performing and then a play on Charles Dickens’ novel Oliver Twist and also a Punch & Judy puppet show, all in the erstwhile style! There is an inclined lift that used to carry the boats from the canal area to the mines, about 200 feet higher up. The highlight of the mining area is the train that takes you inside a non functioning mine which has a video show of the mining life, quiet an experience! It took me almost 2 hours to walk around this well recreated village which was rightly a Victorian experience. Next up was the Iron bridge, which supposedly is the birthplace of industrial revolution and is only a five minute drive from Blists Hill. The industries that were growing the banks of river Severn needed a more reliable crossing and the Iron bridge was the answer. 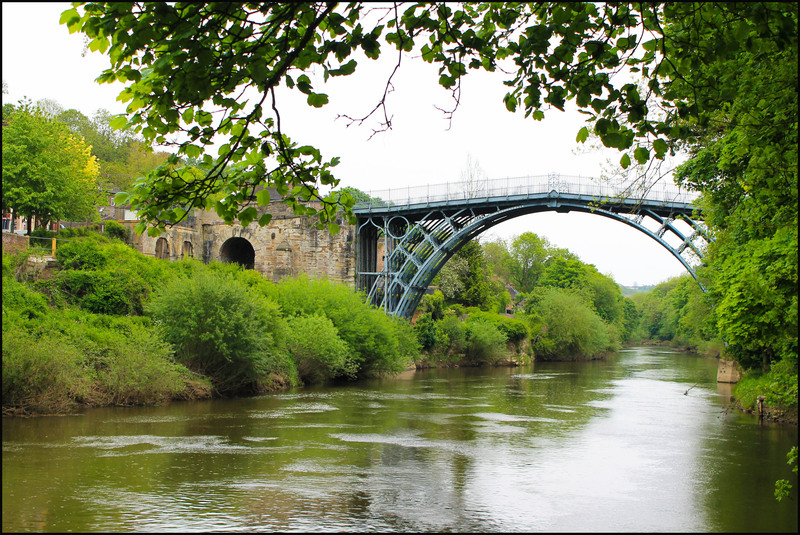 This bridge in the Shropshire district was also a great industrial revolution as this was the first arch bridge in the world to be made of cast iron. Previously cast iron was too expensive to use for large structures. However, a new blast furnace nearby lowered the cost and encouraged local engineers and architects to solve a long-standing problem of a crossing over the river. Today what stands in place is an impressive structure posing over River Severn. The place soon grew in popularity and turned into a favourite picnic spot for the localites. The left bank has a walk way along the river and gives perfect views of the bridge. It was couple of hours in solitude as I walked on the path along the river with the beautiful Victorian buildings on the river bank in sight, a total slip back into the good old days!